Latest AEM data show sales of four-wheel-drive tractors gained 19.7% from October 2015, and year-to-date sales improved. 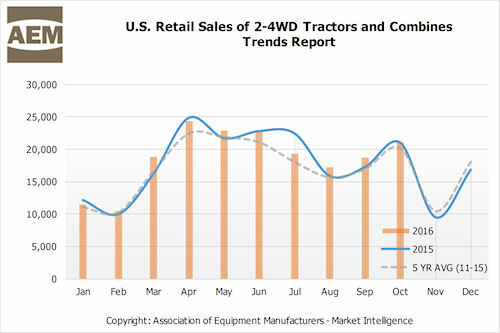 For October, U.S. retail sales of four-wheel-drive (4WD) tractors rebounded, and sales dipped for smaller two-wheel-drive (2WD) tractors under 40 hp and 40-100 hp; however, the pace of year-to-date sales remained the same, with production agriculture machines still in double-digit decline, according to the latest data from the Association of Equipment Manufacturers (AEM), the leading trade group for off-road equipment manufacturers and suppliers. U.S. sales of 4WD tractors in October (year over year) gained 19.7% (compared to -17.9% September year over year), and year-to-date sales improved to -24.4% (compared to -32.4% for September year-to-date numbers). U.S. retail sales for 2WD tractors under 40 hp gained 7.3% for October (compared to 16.8% September year over year) and were the only machines in positive territory for the October year-to-date sales, with 11.2% growth. October sales of 2WD tractors 40-100 hp were down 1.6% year over year (compared to 3.9% September year over year) and were down 4.1% October year to date. U.S. sales of 2WD, 100 hp-plus tractors dropped 21.3% for October and were down 22.5% year to date. Also, U.S. combine sales declined 34.9% in October, with October year-to-date sales dropping 25.5%. "Starting the last quarter of 2016, we continue to face a challenging environment with a slower global economy, overall slumping commodity prices and weak exports negatively affecting equipment sales," AEM senior vice president Charlie O’Brien said. “While we saw a significant bump in the sales of 4WD farm tractors this month, the uptick is unlikely to signal a change in the overall trends. The increase in sales during the October period is quite seasonal, and while this year was no exception, the 4WD tractor October numbers are still far below pre-downturn years,” O’Brien added. The Canadian market saw a strengthening in 2016 as 4WD farm tractor sales increased 9.5% from October 2015 to October 2106, although year-to-date sales were down 4.3%. Total 2WD tractor sales were up 9.5% for the month and down 10.9% for the year.